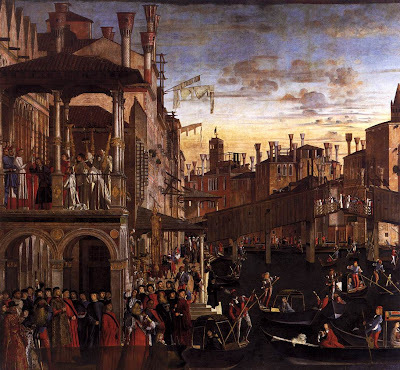 Vittore Carpaccio (1472-1526), The Healing of the Madman, Tempera, c. 1496, 365x389cm., Venice, Accademia. Until now, after a visit to the Accademia, I had forgotten how enormous some of the most famous Venetian paintings are, and therefore how absurd it is to try to understand them in art book reproductions; it's like reading a violently condensed version of War and Peace or the Canterbury Tales, the essence of the real work being that it's not condensed. These all are works meant to be browsed and savored for their richness of detail and anecdote, the inexhaustible mess of existence. 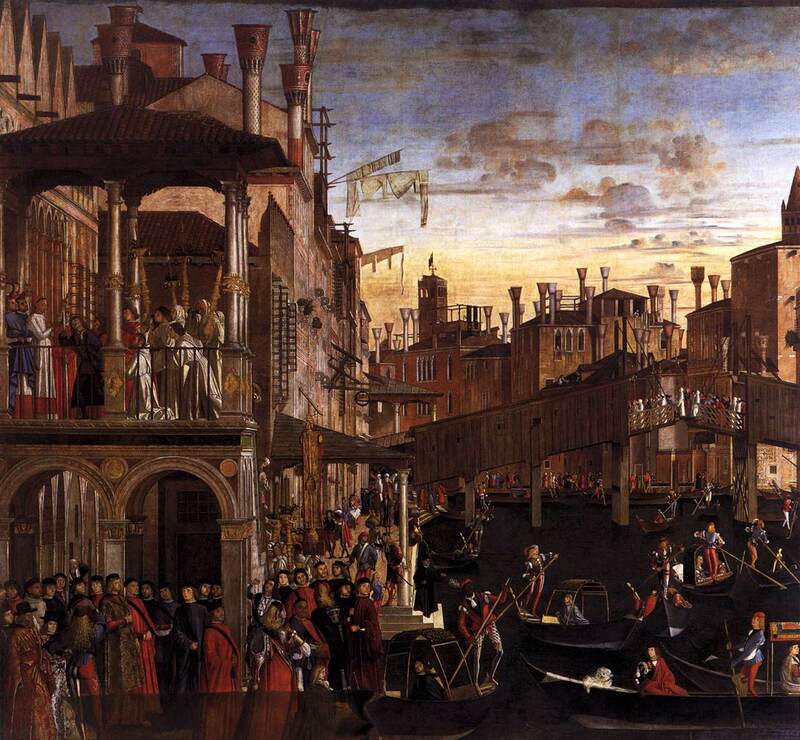 Take, for example, this exceedingly bright little dog, become ghostly after 500 years, no bigger in the actual paint than on most computer screens, yet a single snapshot detail from a Carpaccio the size of a basketball court; the number of similar details in this one painting is enough for hours of pleasure, a simple fact lost nearly entirely when seen in "reproduction", where whatever the color fidelity, the simple reduction in size has already rendered such "details", which are in effect the essence of such painting, effectively invisible. 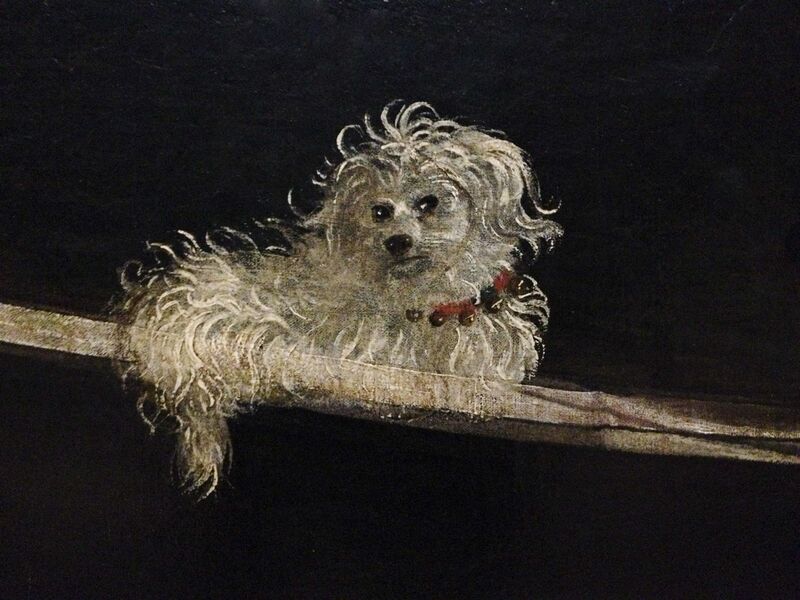 Notice our little dog with so much snarky attitude is a mere speck at the bottom of the painting, completely invisible in reproductions, which is sort of my point. That is to say, one should look at paintings like this, only as an original.